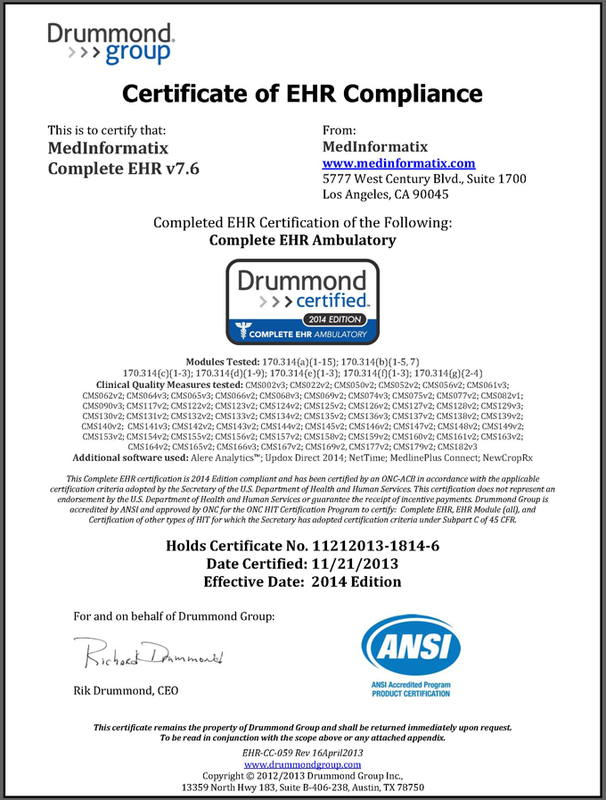 MedInformatix Version v7.6 is certified for Meaningful Use (2014 Edition) as a complete EHR. MedInformatix Complete EHR v7.6 meets the Complete EHR certification criteria as a single product. License-based solution: MedInformatix offers a license-based solution for a one-time software license fee per seat, with additional fees for implementation. Additionally, there is a supplemental monthly support and maintenance cost calculated based on a percentage of the value of the software. Implementation costs do not include travel and airfare costs, which are billed separately. Depending on the customer’s selected lab company and their current transactional volume, this certified product-version may require the purchase of the interface engine, a one-time set-up cost per interface in order to establish that interface which is used to electronically transmit results, and on-going maintenance and support costs. This is in regards to criteria 170.314(b)(5)(a) – Incorporate laboratory tests and values/results and 170.314(a)(12) – Image Results. This certified product-version may require an initial interface set-up cost and on-going maintenance and support costs to establish interfaces for reporting to immunization public health agencies or any specialized registry. This is in regards to criteria 170.314(f)(3) – Transmission to Public Health Agencies – Syndromic Surveillance. Support and maintenance for integration of this certified product-version with other ONC certified systems may require additional one-time set-up cost and/or re-occurring maintenance and support costs. Depending on the patient’s preferred mode of communication while utilizing MedInformatix Complete EHR for practice-to-patient communications, transactional costs may apply per call/SMS/voice message delivered using our Patient Notification View. This is in regards to criteria 170.314(a)(14) Patient List Creation. Generating and/or transmitting a QRDA or other format file(s) required participation in payer quality initiatives/programs may require one-time file generation costs and/or recurring file generation costs. This is in regards to criteria 170.314(c)(3) Clinical Quality Measures – Electronic Submission. This certified product-version may require an initial interface set-up cost and on-going maintenance and support costs to connect via Direct Mail. In order for the EP to use the Direct Mail application, the EP must subscribe to Direct Mail services, provided by a single vendor, Updox. This is in regards to criteria 170.314(b)(1) – Transitions of care – receive, display and incorporate transition of care/referral summaries and 170.314(b)(2) – Transitions of care – create and transmit transition of care/referral summaries. This certified product-version requires on-going subscription costs to send electronic prescriptions, execute drug/drug and drug/allergy interaction, and maintain prescription drug lists. This is in regards to criteria 170.314(b)(3) – Electronic Prescribing. For customers interested in electronic prescribing of controlled substances (EPCS), identity-proofing (IDP) needs to be completed. There is a one-time implementation fee to complete the IDP and registration, as well as a monthly subscription fee per provider. Depending on the customer’s needs, there may be costs for any additional services outside the standard agreement (such as additional implementation services, database analysis services, and additional training services). This certified product-version is certified to Clinical Decision Support (CDS) criteria 170.314(a)(8) using a single CDS vendor, Persivia, or through an internally developed CDS process that meets minimum criteria relevant to the specialty. This certified product-version is certified to Direct Mail criteria 170.314(b)(1) and 170.314(b)(2) using a single HISP, Updox, who is a DirectTrust member. There may be additional agreements and associated costs that an EP must enter into with a third-party vendor (such as a clearinghouse, lab company, etc. ), depending on the customer’s needs. To view the listing from the Certified Health IT Product List, please visit the ONC CHPL website & search for MedInformatix under the 2014 Edition Complete EHR certifications.